If you are lucky enough to be having your wedding or any other special occasion, such as a wedding anniversary or maybe a milestone birthday on the Isle of Wight, Sue & Gary would like to welcome you to The Honeymoon Suite at Sorrento Lodge - a Grade II listed, early Victorian building which has recently been totally refurbished to an extremely high standard. 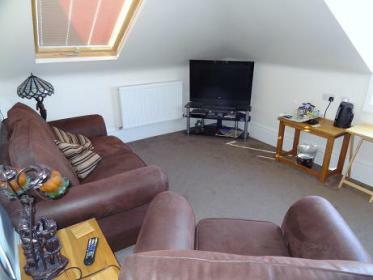 We are situated in a quiet location, but only a short walk to Ryde Esplanade and the superb sandy beach. The luxurious accommodation features a wonderful Spa bath, relaxing sofa and easy chair, telescope and a large screen LCD TV. 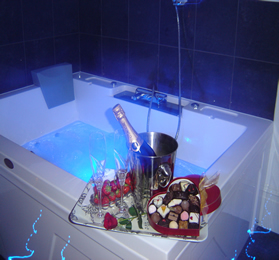 You will also find complimentary chocolates and bottle of bubbly on ice to welcome you on arrival. Breakfast in bed is also available if required. 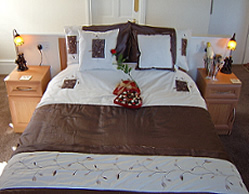 You may also book the Honey moon suite with no extras at a cost of £140 per night.